If you are looking for an expert to help with high density storage solutions for files, books, documents, binders, equipment, weapons or gear – from Jacksonville to Gainesville to Tallahassee — just call Patterson Pope! We have been fixing problems like yours for more than 40 years. We provide excellent support, a comprehensive product offering and we can securely store any item under the sun that will save space and look good. When we say any item under the sun, we mean it. We provide mobile shelving and high density storage solutions to a variety of customers who come from a wide range of industries. Each industry has unique high density storage needs, and we are able to meet them all. 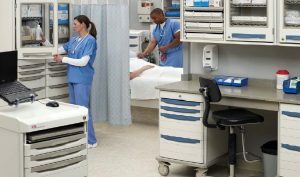 For medical facilities in Jacksonville, we offer carts, lockers, and mobile shelving, as well as high density storage systems that store both active and inactive patient information. 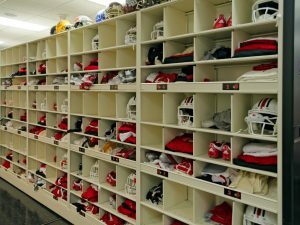 College campuses (as well as high schools and elementary schools) throughout Jacksonville and the surrounding area count on our static and mobile shelving systems, filing systems and automated retrieval systems. 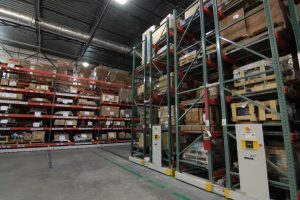 Operators of industrial facilities have found many uses for our ActivRAC industrial mobile shelving system, which slides side-to-side, and saves valuable warehouse space. Government and commercial buildings have a major need in common – file storage for the mounds of paperwork that must be stored safely and compactly. Open shelving and modular drawer cabinets are perfect for these needs. 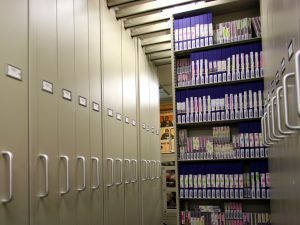 We also provide Gemtrac high-density media and tape storage cabinets that are ideal for storing media such as tapes, DVDs and CDs – Librarians simply love these products! 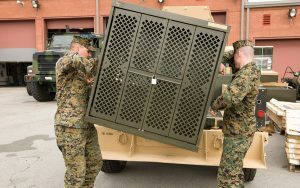 Our weapons storage units are top-of-the-line, which is why the military trusts our expertise for their weapons and equipment. Law enforcement officials also utilize our secure lockers, racks and cabinets, to ensure that their gear and firearms are out of harm’s way. 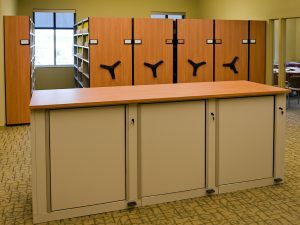 And for evidence storage, we provide pass-through and non pass-through secure evidence storage lockers. The team at Patterson Pope proudly provides mobile shelving and high density storage solutions to the greater Jacksonville area, including St. Johns, Gainesville, Palm Coast, St. Augustine, Fernandina Beach, Lake City, and other surrounding areas.